1. A gold metal tripod lamp with an easy on/off switch that'll provide a modern touch to any room in your home. To clean, just dampen a cloth to remove dust. 2. Or a minimal standing lamp so you can get the necessary lighting without sacrificing any space. It's ideal for smaller spaces with tight corners! This lamp can be converted from a standing lamp to a clamp-on desk lamp. It also provides two different types of light (bright, warm), so you can adjust depending on the time of day and your activity. Plus, it can be bent 360-degrees to reach the exact angle you're looking for. 3. A light green macrame wall hanging to add texture to your otherwise bare walls. Each macrame is handmade and unique! This one is 14-inches long. Price: $16.13. For a more monotone color, check out this beige macrame wall hanging. 4. A colorful shag rug that'll fight off freezing cold floors and add some cushion under your feet. This rug is safe to vacuum and can be easily spot-cleaned. 5. And for ultimate comfort, a couple shag pillows to make your bedroom so cozy, you'll never want to leave. With so many colors, you can mix and match to your heart's desire! 6. A Himalayan pink salt lamp for a relaxing environment and calming glow. It's great for a home office to aid in stress reduction. The lamp already comes with a bulb, so there's no assembly required! 7. An ombre throw to provide warmth when you're snuggling in for movie night. It's microfiber construction will keep you warm without overheating. It'll also get softer after each wash (just machine wash on cold). 8. A strand of fairy lights so you can decorate your home to be a twinkling wonderland. These 20-feet strings have eight light modes so you can go from consistent light to twinkling whenever you want. They're battery operated (AA) and remote-controlled, so you can easily switch between the eight modes. The insulated copper wire keeps the lights from overheating, too. 9. A two-tiered bar cart with glass shelves, bottle rings, and locking wheels for a supreme serving station. This will become an instant hit at your next dinner party. You can easily wheel this cart into whatever room you want, so it can be used as a mini bar or as a place to serve appetizers. 10. 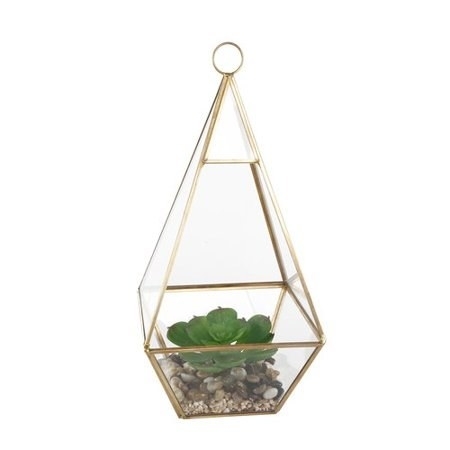 A faux succulent terrarium to hang or place on a desk or bedside table. If you've got a brown thumb, you don't need to worry about accidentally killing it! 11. A set of agate coasters with gold trim that'll provide your glasses with a chic place to rest. Goodbye messy water rings! Each coaster has no-slip feet underneath to protect your surfaces. 12. A cotton pouf that can moonlight as extra seating or as a foot rest when needed. 13. A woven runner with fringe to turn your boring table into a little decorative oasis. It can fit on round, square, or rectangular tables. 14. A 100% cotton medallion tapestry for an instant wall transformation. This will cover your white walls, adding color and pattern to liven up your space. 15. Marble bookends so your favorite reads can proudly be on display. No worries though, these marble bookends have pads on the bottom to prevent scratching or scuffing. Be careful! These bookends are heavy. 16. 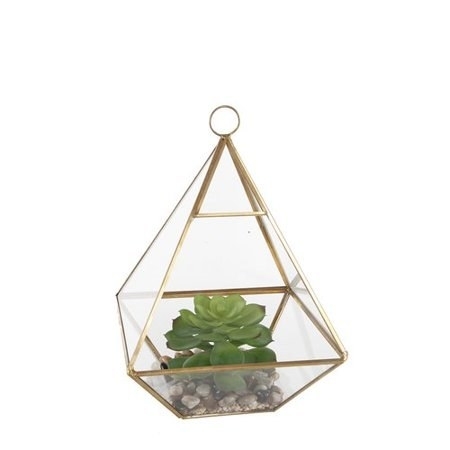 A tabletop geometric sculpture to decorate open shelving with. This sculpture is 100% iron with a gold finish. If you're looking for more sculptures for shelving or bookcases, check out this gold star figure. 17. A mini globe that'll inspire travel while also looking incredibly cute on your coffee table. 18. Mercury glass votives to sprinkle into your decor wherever you need a bit of sparkle. You can even add these to your table's centerpiece decor. These come in a set of 12. For prolonged use, LED tea lights are recommended, but regular tea lights can be used. 19. A rattan basket ideal for holding throws or extra pillows. With handles, this basket can be easily transported, plus the painted bottom and tassel provide a sophisticated touch. 20. Faux succulents in cement planters to add some greenery to your space — without the upkeep. Note that these guys are mini; each one measures only 3.5-inches tall. 21. A vanity mirror tray so your perfumes have a resting place on your bathroom counter. Why hide your beautiful bottles if you don't have to? 22. A baroque mirror you can place in your bedroom or bathroom for elevated elegance. This mirror is easy to hang with all necessary hanging materials already attached. 23. A mounted shelf with five hooks that'll be oh so handy in your entryway. You can hang coats, keys, and even place bills to be paid on the shelf so you always remember to mail them. 24. A warmer that'll release the aroma of whatever wax melt you choose. Just place the melt on the dish and turn on the warmer. Once the wax has melted, you can pour it into its mold to harden and be reused. This warmer includes a bulb, but wax melts are sold separately. Reusing wax will save you a ton on candles in the long run. Price: $14.99. And check out these vanilla cookie crunch wax melts for a great scent option. 25. A coir doormat so you'll always be greeted by a warm welcome, even if your day wasn't so happy. This one has a vinyl backing to ensure it stays safely in place. The natural coir makes it super weather resistant and durable. Plus its texture will get all mud and gunk off your shoes. It's also mold and mildew resistant. 26. 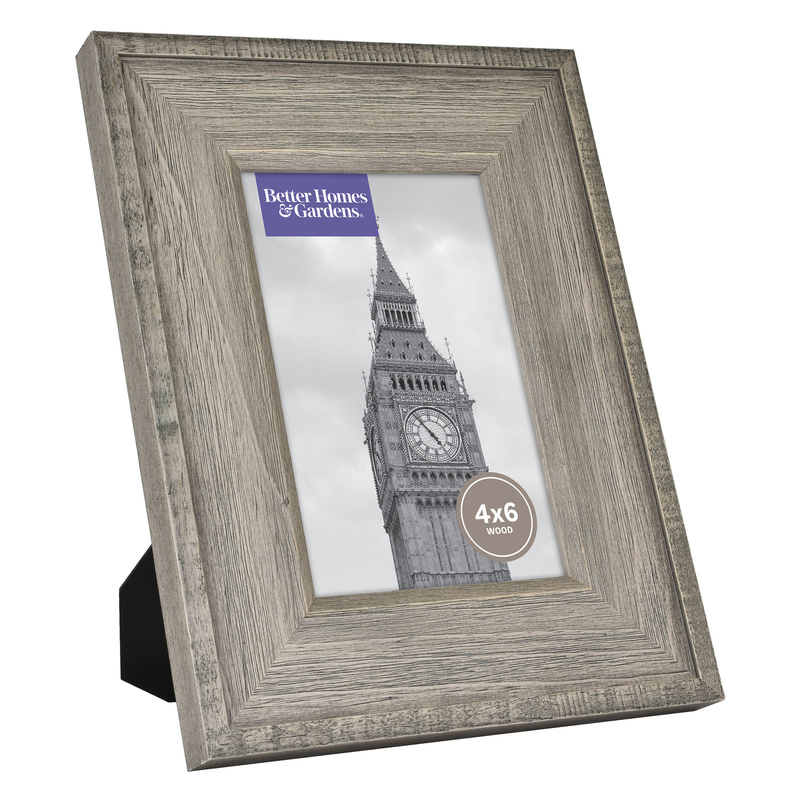 A wooden frame for your bedside table or for a gallery wall. Either way, you'll be able to commemorate some of your most beloved family memories. Price: $6.44 for a 4" x 6"
Also check out a 5" x 7" frame and a 8" x 10" frame from the same collection. 27. A faux-fur sheepskin you can throw over dining chairs, dining benches, and....literally anything else for instant warmth. 28. A glass hurricane vase to hold blooms or simpler floral arrangements like palm leaves. 29. A sunburst mirror set that you can arrange together or separate based on your needs. 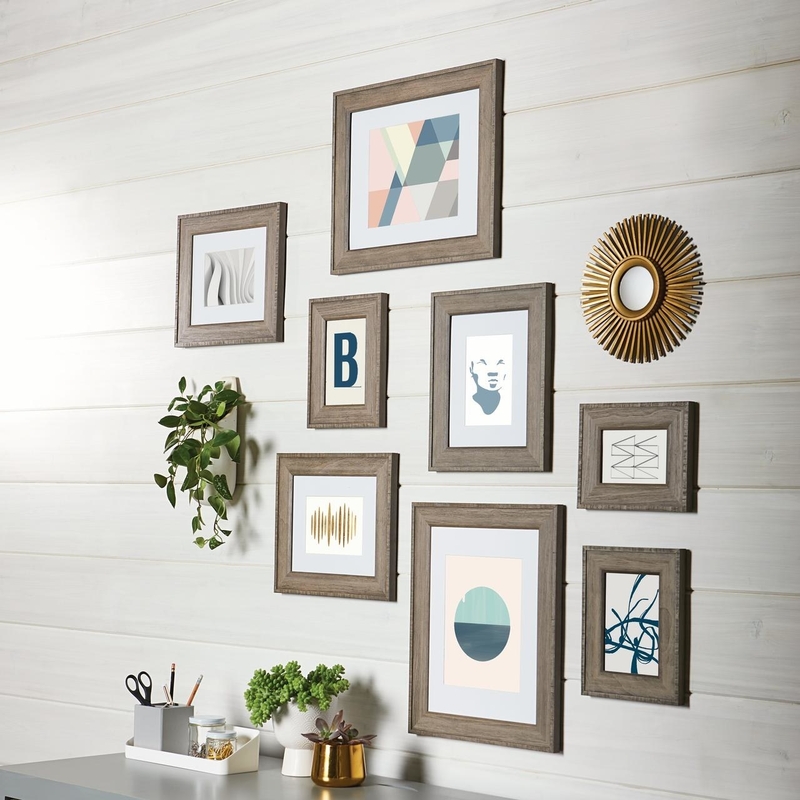 They can even be mixed into a gallery wall! Each mirror measures 10-inches in diameter, so they won't be bulky or take up too much space on your wall. 30. A fashion art print for your bedroom to remind you to always dress like the glamorous queen you are. You can either get this print as a canvas or framed in wood. Either way, each will come equipped with the necessary hanging materials. 31. A Disney marquee sign if you grew up a true Disney kid and want to remember the good ol' days of animated movies like Hercules and The Lion King. This sign can plug into any standard outlet (bulbs are included). It also runs on a timer so you can program when you want it turned on and off. 32. A farmhouse wall clock to achieve that farmhouse vibe Chip and Joanna do so effortlessly. 33. A lucite pull with satin gold accents to perk up your kitchen cabinets. You can also add these to a bedroom dresser! Just think about all the money you're about to save!! !